10 March 2016: A detailed analysis of HadISST has identified a number of problems, some of which might limit the utility of the dataset for certain scientific applications, particularly where high resolution SST data or spatial gradients of SST are required. Thanks to Dudley Chelton and Craig Risien for bringing this to our attention and their detailed analysis. 13/MARCH/2015. Users have noticed that there is a minor discontinuity at the dateline in HadISST1 SST fields starting in 1982. It appears to only affect gridcells just to the east of the dateline. Please note that this can affect estimates of the mean and variability of SSTs in HadISST1 when analysed across this region. 08/MARCH/2011. The switch of satellite source data at the start of 2009 introduced a discontinuity in the fields of sea ice in both the Arctic and Antarctic. 03/DECEMBER/2010. The SSM/I satellite that was used to provide the data for the sea ice analysis in HadISST suffered a significant degradation in performance through January and February 2009. The problem affected HadISST fields from January 2009 and probably causes an underestimate of ice extent and concentration. It also affected sea surface temperatures in sea ice areas because the SSTs are estimated from the sea ice concentration (see Rayner et al. 2003). As of 3rd December 2010 we have reprocessed the data from January 2009 to the present using a different sea ice data source. This is an improvement on the previous situation, but users should still note that the switch of data source at the start of 2009 might introduce a discontinuity into the record. The reprocessed files are available from the main data page. The older version of the data set is archived here. The Met Office Hadley Centre's sea ice and sea surface temperature (SST) data set, HadISST1, replaces the Global sea Ice and Sea Surface Temperature (GISST) data sets, and is a unique combination of monthly globally-complete fields of SST and sea ice concentration on a 1 degree latitude-longitude grid from 1870 to date. Fields for the month-before-last (see image below) are added to the data set on the 2nd of every new month (for users who need faster updates, there is a preliminary version available earlier). In the picture white areas represent land and 100% ice cover. From May 2007 the data set of in situ measurements used in HadISST has changed. The MOHSST data set, which was previously used has been discontinued, and HadSST2 is now being used in its place. The two systems ran in parallel for several months prior to the changeover and no significant differences were seen. The SST data are taken from the Met Office Marine Data Bank (MDB), which from 1982 onwards also includes data received through the Global Telecommunications System (GTS). 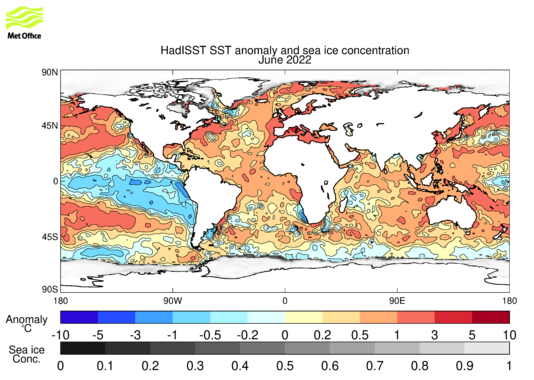 In order to enhance data coverage, monthly median SSTs for 1871-1995 from the Comprehensive Ocean-Atmosphere Data Set (COADS) (now ICOADS) were also used where there were no MDB data. The sea ice data are taken from a variety of sources including digitized sea ice charts and passive microwave retrievals. HadISST1 temperatures are reconstructed using a two stage reduced-space optimal interpolation procedure, followed by superposition of quality-improved gridded observations onto the reconstructions to restore local detail. The sea ice fields are made more homogeneous by compensating satellite microwave-based sea ice concentrations for the impact of surface melt effects on retrievals in the Arctic and for algorithm deficiencies in the Antarctic, and by making the historical in situ concentrations consistent with the satellite data. SSTs near sea ice are estimated using statistical relationships between SST and sea ice concentration. For a detailed description of the dataset and its production process, see the cited paper (in references section). We recommended you read this before using the data. We are planning a new version of HadISST, and we would like advice from its users. We have plans for several improvements, but we would also like to know what you think. If you have used HadISST, or plan to, please contact us and tell us what changes or improvements you would like in a new version. We can't guarantee to please everyone, but we will consider all suggestions. Various diagnostics are produced from the monthly gridded fields.